Happy Memorial Day! We have enjoyed our long holiday weekend. And we have both been survivors of our very angry, angry colony. I haven’t worked in the hives since I got that really nasty sting (see previous post), but my curiosity since I added the winter supers got the best of me and I had to check out to see how the girls were doing. So, this morning, I spent some time with them. And because the last sting was so nasty, I knew that I was going to be fully-suited and gloved the whole time this time. I added the winter supers about two weeks ago and I was wondering how much comb they had drawn out in the winter supers and if they had started to fill any of it with honey. And I wanted to make sure that there was still plenty of egg laying going on. I started with our colony that has always been gentle (which is how we learned in bee school that honeybees act) this morning. I knew from the moment that I took the winter super off of the top of the bottom super that this colony was healthy and doing really well. The winter super was heavy, a lot heavier than I was expecting. I took a picture of the two supers side by side and I was excited from the beginning. The frame that you see hanging on the side of the back super is the frame that is the outer frame of the bottom super. It was 100% full of honey. The bees haven’t capped it yet, but each cell is full of such pretty, light-colored honey. I was so proud. I checked the bottom super to make sure that there was healthy brood and I saw lots of brood and larva, though it looks like a bunch of bees have hatched recently because the amount of capped brood isn’t as much as I’ve seen in the past. But I saw a lot of little bees in a lot of cells, so I know that there is a laying queen in this hive. As I was working this hive, Matt came to visit. No sooner had he stopped his 4-wheeler then WHAM! he was stung on the cheek by a bee. It was so odd…he wasn’t near the hives and he definitely wasn’t threatening them in any way. He left almost immediately to go home and take a Benadryl. I finished up by inspecting the winter super. I couldn’t believe that every frame had comb drawn out on the foundation (in just two weeks)! The combs were a combination of brood and honey. We didn’t add a queen excluder between the winter super and the bottom super. These supers are their supers and we decided that the bees could use these supers in any way that they wanted. When we add a shallow super to the top of the winter super, we’ll add an excluder between the winter and the shallow. It was so exciting and uplifting to see how well this hive is doing. It seems really healthy. I checked the bottom board and there are ants, so I need to investigate if and how to treat for ants, but otherwise, this colony is rocking! I took a break after closing this hive back up to let the bees calm back down before I opened up the next hive (the aggressive hive). I was sitting on the ground, killing time, and was really struck about how pretty it was. 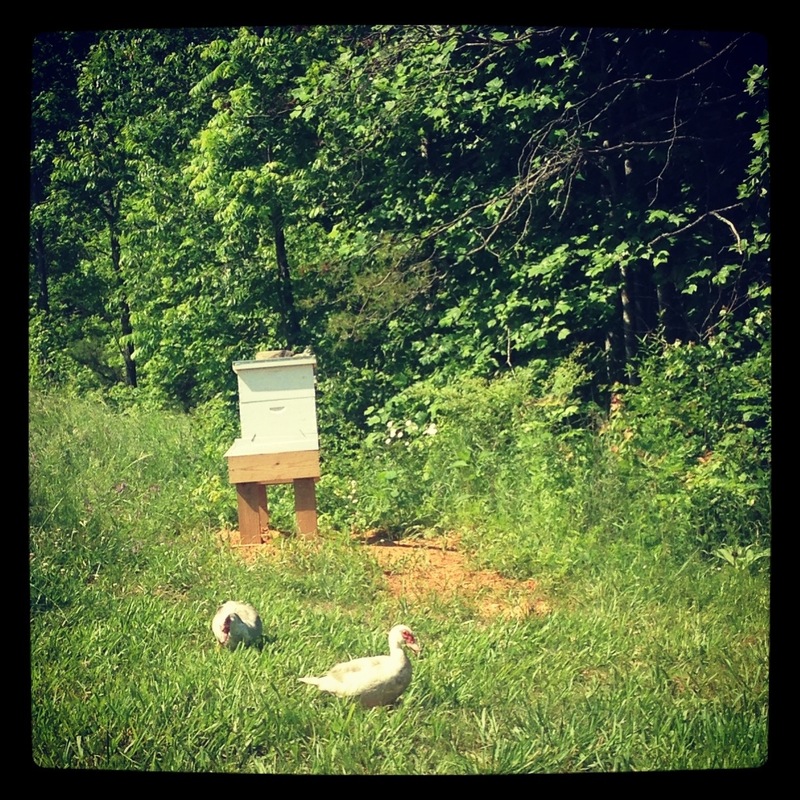 We have our hives on the back part of our property and it is really nice back there. I was sitting there and the ducks from the pond had come to visit. It was just peaceful. Matt came back at some point and we were talking (again, nowhere near the hives) and another bee dive bombed him and stung him on the face. No warning, no nothing. It was so unexpected and weird. He took off (not to come back) and ended up having to come home and shoot himself with an epi-pen and lay down. Then, I went into our aggressive hive. I smoke the hive, I approach it slowly, I try to do everything correctly as we have learned. And that hive is just one angry hive. The minute that I open the hive, the bees start to attack me. And they don’t let up. I took a picture of them flying around my face as I was trying to check the frames in the bottom hive. I ended up checking the bottom hive (which looked fine) but didn’t do anymore than a quick check of the winter hive. 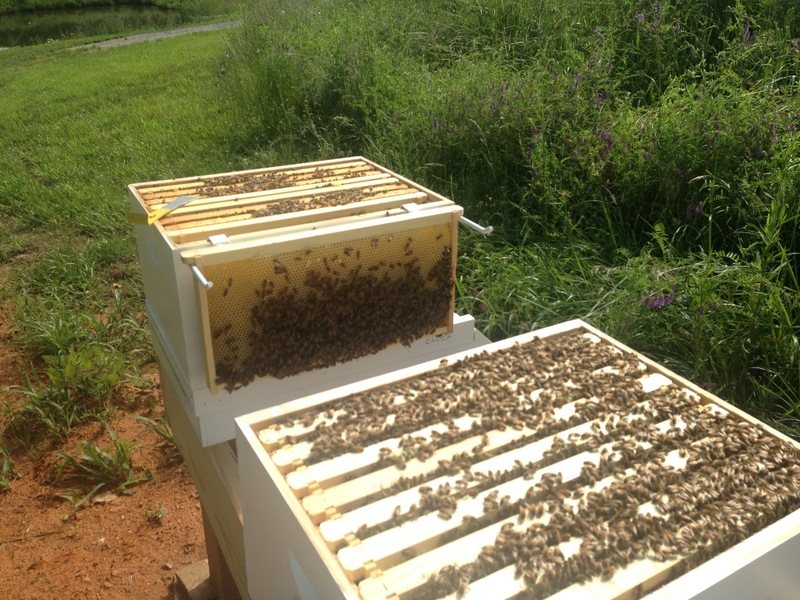 I did notice that the drawing out of the comb in this hive wasn’t nearly as far along as in the other hive and there wasn’t nearly as much honey in this hive. I closed this hive up as quickly as I could. Despite the gloves, I still got stung twice today. Once, very slightly, just barely got me in the palm of my right hand. The second time, the bee got me good in a knuckle of my left hand. Right now, that finger is swollen and sore, and the hand is starting to swell, but no bruising (yet). I’m hoping that being stung through a glove will mediate some of the damage. After I closed the angry hive, I walked away about 40 yards, hoping that the 20 to 30 bees that were constantly banging against my hat and veil would then leave me alone and fly back to their hive. No such luck. These bees followed me no matter how far away from the hive I walked and continued to “attack” me, no matter how long I waited. I just stood still for about 10 minutes and they continued to kamikaze me. I’ve never heard of this kind of behavior from honeybees. It’s disturbing that they are so aggressive. At this point, I’m not working that hive again. It’s too aggressive. I came home and told Matt that my plan was to just leave it alone. I don’t care about the honey, I don’t care if it swarms. But I do care if it swarms (angry bees) and I want to make sure that these bees don’t harm the nice bees next door. 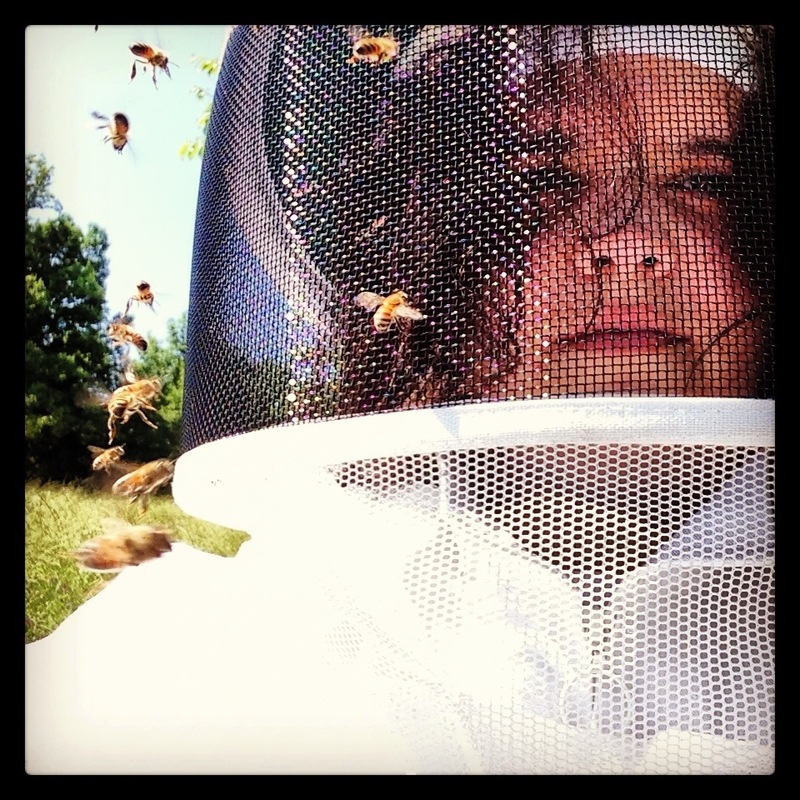 I need help from an experienced beekeeper. These bees need a house in a hollow log, deep in a forest somewhere. They are anti-social bees.